This vegan Quinoa & Chickpea Salad was the result of my cravings for a plant-based meal. Freshly-squeezed Meyer lemon juice and sliced avocado added tons of flavor, too. Springtime is coming, it really is! We actually saw the sun in California starting late last week, so my mood brightened and I started to yearn for some lighter flavors. I came across a giant bag of quinoa when I was cleaning out my pantry during one of the power outages we had during the rains (because what else am I supposed to do when my internet is down?! Ha). I didn’t even add any oil to this recipe, just a squeeze of a Meyer lemon and a chopped avocado for some healthy fat. Alan and I ate this almost every day last week for lunch. He never even complained about it getting monotonous. So, either he wasn’t paying attention, or he really liked it. Win! This salad is as easy as cooking quinoa and adding chickpeas and chopped veggies. Squeeze some lemon on top and add chopped avocado. Done! 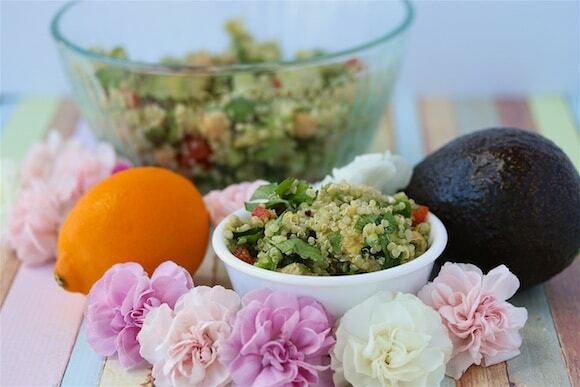 Combine the cooked quinoa, chickpeas, chopped parsley, chopped bell pepper, chopped green onions, lemon juice, and avocado in a large mixing bowl. Add salt and pepper and stir to make sure everything is combined. Store any leftovers in the fridge for up to 5-6 days. This is a short post for a busy week. Stay healthy and strong, friends. We’ve got less than a month of winter to go. I was SO EXCITED to see the sun =D =D =D It’s warming up a bit and I’m also looking for lighter, refreshing meals. This will definitely be making an appearance in my kitchen soon! Me too!!! The sun makes me happy! Hoping to see your beautiful sunny face and sunny pup soon. XOXO. Yum! I love salads like this! Looks tasty and refreshing! Perfect for spring and summer! Love all of the refreshing flavors in this! I bet this would be perfect for spring potlucks and get togethers. What a simple recipe to make. I bet my son would love this one! It is perfect for a light and healthy lunch. 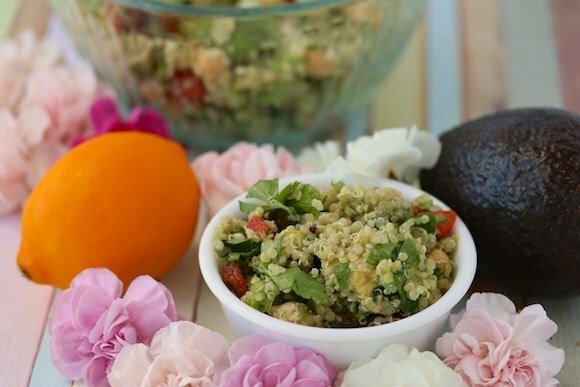 I don’t really like quinoa but it really looks good in this salad! I think I need to try this out. I don’t serve quinoa often enough! I always forget! My kids love meal bowls so I know they would like this – thanks! 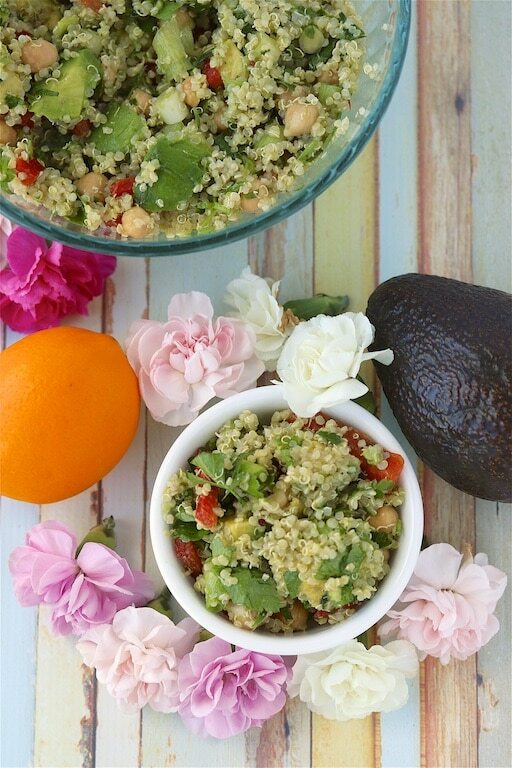 I totally adore quinoa…and the avocado too!! Swoon!! Sounds SO good! This is so simple yet so yum and nutritious!! So easy even my husband could make it when I’m out town! This is total comfort food for me. I love all those nubby textures and wholesome ingredients! I love quinoa salad! You just reminded me to make another batch soon. Thanks for the recipe. What a great recipe to make for lunches during the week! And love that you added avocado… so full of healthy fats and it always makes a salad that little bit special. 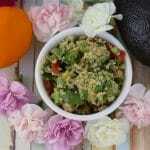 Quinoa is great for salads and amazing for spring healthy eating . Love it! I love adding quinoa to salads! In fact, I make a very similar salad to this one but never tried adding chickpea in it. Thanks for the inspiration! I love salads like this — fresh and light with tons of bright flavor! Well done. What a delicious way to get your grains and stay healthy. This side dish would be ideal for any bbq or spring and summer dinner. Love a dinner that comes together. This salad has two of my favorite ingredients in it..quinoa & chickpeas. You can never go wrong with this combination. Beautiful clicks , and beautiful looking Salad . Perfect for a healthy lunch .